The Emerging Forces of Fashion Issue is about those making head way by taking care of there business. This issue is about the rising professionals who are taking the necessary steps from a labor of love to a business. Separating themselves from a starving artist to now a paid professional. 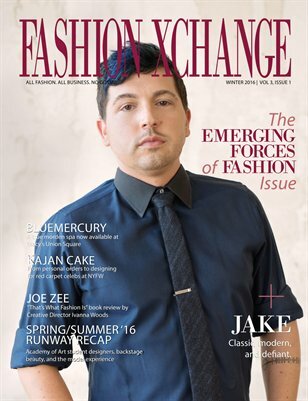 Featuring JAKE by Jake Wall, Kajan Cake by Kanjana Carlos, Sweets Jewelry, editorial by Art Director Paolo Glam, BlueMercury launches a modern spa inside Macy's Union Square, A look back to the Academy of Art University student designer of S/S '16, backstage beauty, and a sneak peek into the models experience during New York Fashion Week.